It has been a couple of years that we saw the VisionC concept rolling out of the Skoda house. 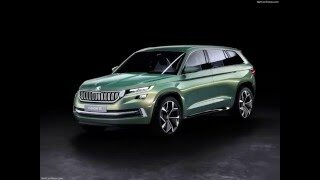 At the Geneva Motor Show 2016 they took a step ahead and unwrapped the gorgeous hybrid Skoda VisionS Concept 2016. The concept is larger than the Yeti and is also visually more attractive. Let us have a look at the review of Skoda VisionS Concept 2016 to know in detail about it. The interior of Skoda VisionS Concept 2016 is somewhere like the other concepts, ‘FUTURISTIC’. Each of the passengers gets their own touchscreen display. To attain this they have mounted two screens on each of the headrests for the rear passengers while for the front row there’s a wide display running through the dash. Company further shares that each display unit can be controlled by each of the screen. Talking about the driver, he finally gets his own tablet-kind display housed in center console while accompanying the driver is another digital display that makes the instrument cluster. Apart from the tech features the model gets high-end gray colored Nappa leather covering the interior with the dark blue patterns madding the contrast. Thus rounding up the interior details of Skoda VisionS Concept 2016 I would call the concept as futuristic, luxurious and comfortable. The exterior of Skoda VisionS Concept 2016 gets larger in comparison to the Yeti while is equivalent in height with the recently shared Chevrolet Equinox. Talking about the front fascia we have the traditional grille amidst the sleek headlights. Beneath the set up is a set of redesigned fog lamps and a dominating horizontally placed splitter. Moving towards the rear along the sides you’ll notice the sharp lines moving through the doors while the roofline further adds a new glory. There is a spoiler like integration at the rear while the taillights carry the resemblance with the recently seen concept. 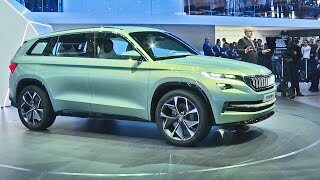 Thus rounding up the exterior details of Skoda VisionS Concept 2016 I would call it gorgeous and attractive in its distinct way, though with a couple of similarities. Beneath the hood of Skoda VisionS Concept 2016 sits a hybrid drivetrain. This includes a 1.4 liter TSI four-cylinder engine producing total output of 156 hp and peak torque of 250 nm. This further gets connected with two electric motors of 53 hp in front and 113 hp at the rear. The motors produce peak torque of 220 nm and 270 nm respectively. Thus the total output of the concept touches 322 hp and peak torque of 740 nm mating to six-speed DSG transmission. With this the top speed of Skoda VisionS Concept 2016 touches the mark of 124 mph while the 0-62 mph sprint can be knocked in 7.4 seconds only.